Making a Faux Garden Head isn’t as hard as it looks, keep reading to meet Betty Bling! I am obsessed with gardening. It’s one of my compulsive behaviors. Like my obsession with Butterflies, Giving Away Books, and Learning About My Dead Relatives. Did you know that I once painted the 11 rooms in our big, old Victorian house 33 times in a span of 10 years? I really do get obsessed with things. I just can’t help myself. Right now, my gardening obsession comes from the fact that it’s late spring and it’s still cold outside in Wisconsin. I am desperate for an outlet since I still can’t plant anything in the garden. 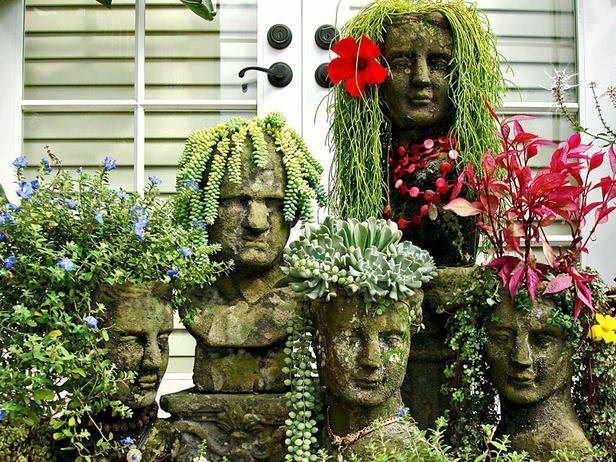 If you follow me on Pintrest, you will know that I have had this garden head photo pinned for a while. You see, I used to work at a greenhouse. Every spring the owner would get a shipment of these heads and they would sell like hotcakes. Every year I would promise myself I would buy one but I never did. Probably because they retail for $75.00 or more and just didn’t fit into my thrifty home school mom budget. But, I still wanted one. Badly. Have you ever put something off that you regretted? Recently I spied this foam head at the craft store (Hobby Lobby) and I got to thinking…. Hummmm, I wonder if that would work as a garden head? It was only a few dollars so I decided to try it. I also picked up some Magikote Primer and some Krylon Stone Metallic Spray Paint. I decided to name my garden head Betty Bling. •First of all I painted Betty with 2 coats of the Magikote Primer. It seals the foam and makes it ready for the finish coat of paint. •I put Betty atop an empty wine bottle to dry. She has a hole in the base of her neck that works great for this purpose. My kids said it looked creepy. Nah. I don’t think so. •When she was dry, I drew a 6″ circle at the top of her head with a compass. I used it as a guideline for painting, I didn’t want to paint the portion I knew I was going to remove later for planting. •Then I sprayed Betty with the Stone Metallic paint. I used two coats which would have dried sooner had I brought it into the house. Why do I not think of these things until it’s too late? •When she was finally dry, I hollowed out the top of her head with a sharp knife. I probably should have purchased the special knife for cutting foam at the craft store, but instead I used a parring knife which really made a mess of things. Sometimes I am a slow learner. •Finally, I made a hole for drainage….. Seems like this was easy since she already had a hole at the bottom of her neck. •Then I added some small pebbles to the wine bottle for stability. •I fell in love with this succulent from Home Depot and decided it would be perfect for Betty’s hair. • Betty got some Bling with a few pieces of my old jewelry and some extra glasses. I hadn’t intended to keep the garden head Betty on the wine bottle permanently, but I kind of like her there. She looks more interesting floating in the air. Maybe I will change my mind about this when it comes time to put her outside, but for now she’s going to stay put. Someone said she kind of looks like me. Nah, I don’t see it. Do you? p.s. I have gotten some of the nicest comments lately, thank you so much for reading and commenting! I really appreciate it!